While popular media isn’t solely to blame for food-related issues, it is somewhat responsible for the unwanted cravings that many of us struggle to fight off. Popular video games are just some of the marketing ploys that often shove candy and chocolate in our faces whenever we look at our smartphones or social media. The most popular mobile games today are filled with sugary suggestions and animations, such as Candy Crush Saga and Sugar Smash. Why can’t more games promote healthy food? For example, Blast Vegetable and Fruit Shop? Fruit Shop is featured on the Slingo gaming site. If more games were to promote nutritious meals rather than sugary treats, perhaps we wouldn’t crave so often such unhealthy junk food. To reduce these torturous cravings, we might consider using fruit in desserts. While fruit is much healthier than white sugar, it still contains sugar. It’s therefore best to stick to reasonable portions. In addition, if you’re going to use sugar, use brown as it’s much healthier than refined sugar. Brown sugar contains more minerals and other nutrients than white sugar. Try this recipe for Cinnamon-Baked Pears to create a healthier dessert for your family and friends. It can also inspire you to create other recipes using fruit and other natural ingredients. This recipe was kindly contributed by Amanda Conway. In a bowl, combine oats, ground cinnamon, sugar, almonds, and salt. Then, pour in half of the melted butter (or coconut oil) and mix. Cut the pears in half and scoop out some of the center. Then, brush the insides with the remaining butter, and sprinkle with cinnamon sugar. 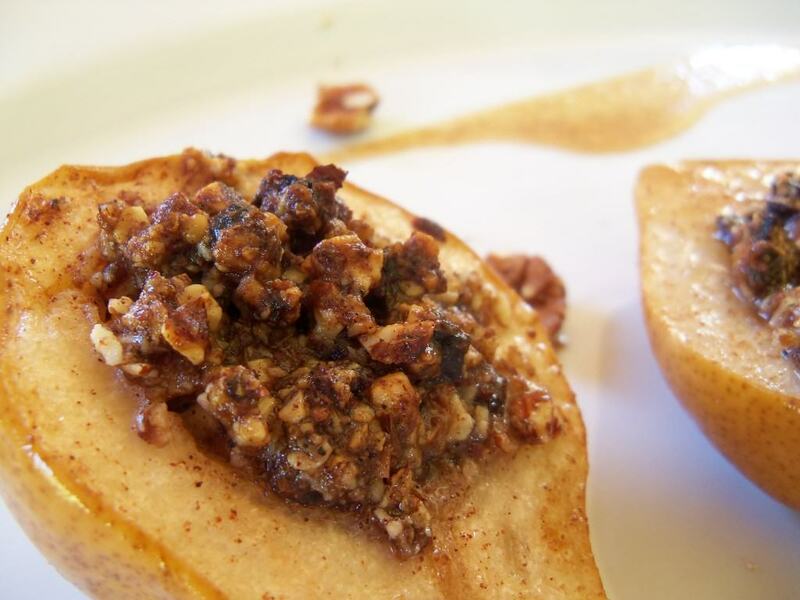 Spoon the oats and cinnamon mix into the center of the pears. Bake for 35 to 40 minutes or until the pears get soft. If you don't like almonds, you can substitute them with pecans or crushed walnuts. You can also use apples instead of pears for this recipe. For a paleo version, substitute equal amount of ground flax seed, quinoa flakes or chia seeds for the rolled oats in the recipe. Also substitute coconut sugar or honey for the brown sugar (and sugar in the cinnamon sugar). Honey may change the consistency a bit as it is more liquidy. For a paleo or vegan version, substitute coconut oil for the butter in this recipe. Although some paleo enthusiasts permit grass-fed butter, many do not.